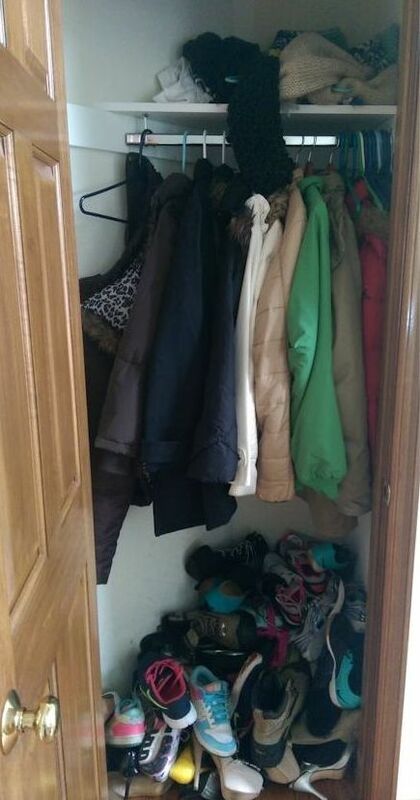 The hall closet in my front entryway is so full of my daughter’s clutter that the other family members haven’t kept anything in it for many years; we’ve all been using the closet next to the garage door instead. Given the fact that she spent the past four years away at college, at the very latest I should have dealt with it when she first left home. Last summer, when she accumulated so much stuff that the door wouldn’t close, I told her to clean it up, and she dutifully filled three large bags with stuff to give to the thrift store. But this is a girl who can’t pass by a pair of shoes on sale without gleefully adding them to her collection, so the closet soon filled up again. I have no idea how she ever manages to find a pair of matching shoes in there, when she just throws them all in a colossal heap. No more! This year I’ve resolved to free my house of clutter, and it’s past time for all the stuff in that closet to depart on a one-way journey—either to the thrift store or to my daughter’s new apartment, as she prefers. She put in her rental application today, and plans to move into the apartment next weekend. When she does, I want the closet completely empty. Although it can be sad when a child grows up and leaves home, I won’t be mourning the loss of that clutter!